This has been my life for the past two weeks…well, the past two months. I have enjoyed every moment of the past 72 hour work week. Countless hours sewing, doing paperwork and watching rehearsals, all leading up to opening and running four runs of ‘Les Miserables: A Story of Grace’. It was such a blessing to Costume Design this amazing production with so many talented people to work along side. However, it was, of course, a huge distraction from writing. Luckily, the next show isn’t until February, so a little break from drawing and sewing is welcomed. If I could spend every day designing and writing and drinking coffee, I’d be one happy girl! But unfortunately, these little things called ‘rent’ and ‘bills’ and ‘food’ often get in the way, which cause a clumsy, 30 hours of retail work to fall in the way of most of my plans. But that ogre called ‘Retail Sales Associate’ is a necessity of life and I am thankful for the job. If anything, it certainly makes me treasure the times – like this past week and November – where I commit to really throwing myself into something I love to do. The sacrifices are well worth a couple less hours of sleep each night and worthless time scrolling through my Facebook news feed. My husband and I often talk about investing in the things where we want to spend more time, like giant whiteboards for our home, awesome desks for work at home, and crazy awesome storage for our trinkets and books to free up space for our puppy. We have certainly found that when we invest in something, we are more willing to be in that space or doing that job. For instance, my 214 NaNoWriMo mug. Isn’t it freakishly adorable? A mug that can only be used while I’m writing. With a face like that, how can I resist? Being able to drink some yummy coffee or tea from this mug is almost motivation enough for me to write for however many hours I can spare in a day. The little things make such a difference, not only in my writing space and focus, but also in life. Despite hardships, God blesses us so much, but it takes big, open eyes to see every little grace He gives us and to be thankful for those things, rather than to focus on what we wish we had. 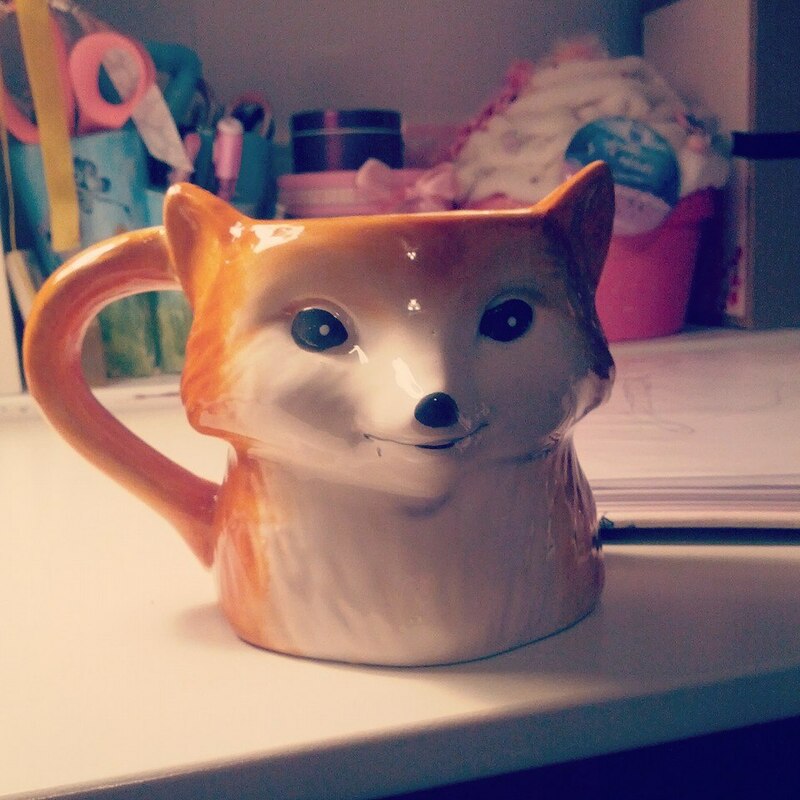 So this November, this little fox-mug – who needs a name, I think – will not only be a motivator to write, but also a reminder to be thankful. Welcome to One Word More! I never knew you Had a blog!! How awesome!